Watching this in stages, hopefully I'll get through it this weekend. I'm probably not going to rewatch this in the super-near future, although I probably will someday. So this isn't super fresh in my memory right now and I'll stick to general impressions, because I have lots of those. As tedious as this movie was to watch--and it was--it's stuck with me pretty hard. One thing that bothers me about a lot of narratives is how everyday things are relegated to the background. Just regular maintenance things like how are this guy's clothes always clean and who is making the food and who is cleaning up afterward. I get why they are--because they're not relevant to the stories most of the time. But leaving that kind of thing in the background all too often means leaving women in the background. So if nothing else, this movie is penance for a minute or two of that. This movie brings all that to the foreground. It elevates those things, even literally, as the camera is looking up at her as she goes about her day. You don't get elided versions, either, like something that just tells you, "Yeah, this is when the dishes get washed," but you see it. The whole thing. And it's a radical shift, that, to something like a female gaze. And the things that a traditional narrative would focus on are treated exactly the same as everything else. They're not elevated in importance by virtue of being more interesting to an audience or anything like that. They're just another part of her existence that takes up about the same amount of space that cooking dinner does. And in the long run, they actually seem less important. I remember the tedious stuff much more clearly than I do the notable events. When I was watching it, there was a scene where she's folding up her tablecloth to put away and I'm still in regular movie mode, thinking that this tablecloth will soon be relevant to some plot point. And I think that the movie had to be as long as it is to acclimate you to this not being that kind of narrative. It's in there because that's what she did, and her life consists of the things she does. Anyway, I might actually think of more to say later. I saw this maybe a few months ago, and it seemed long at the time, and I fell asleep at one point and had to rewind, and I took tons of breaks, but I've thought about it a lot since. And I really encourage everyone to try to get through it however you can, because it's worth it. FWIW, this will be on TCM on Tuesday, October 27 at 03:15 AM (ET) as part of their Trailblazing Women month. Television: It's still a thing! For anyone who watches Jeanne Dielman, 23, quai du commerce, 1080 Bruxelles and would like to have an interesting point of comparison to it, I'd suggest the Pressburger and Powell film Black Narcissus as an excellent contrast. Black Narcissus outwardly couldn't be more different. It's lush and exotic story about a group of nuns opening a convent in the Himalayas. 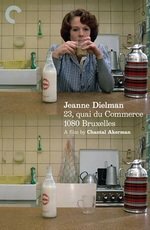 The look of the film is as rich as Jeanne Dielman is spare, but the main underlying themes are almost identical. Rip away the exotic elements and it too is a story of routine interrupted by unbidden arousal. With Black Narcissus the story is informed by a male point of view even though its subject is primarily the nuns, while the point of view for Jeanne Dielman is clearly informed in reaction to that kind of perspective. Thinking about the two movies in comparison might be beneficial for anyone who isn't sure what to think about either of them individually, though I suspect that "either" would mostly mean this film since it is the more unconventional of the two by no small degree. Oh, and in the unlikely event anyone sees my recommendation and takes me up on it. I'd be happy to discuss the comparisons or either film in more detail if my claim seems unclear.